Meet the Directors of Captain America: The Winter Soldier Tuesday, September 9th at Amoeba Music in Hollywood! Tuesday, September 9th at Amoeba Music in Hollywood! WHAT: In celebration of Marvel’s Captain America: The Winter Soldier debuting on Blu-ray and DVD September 9th, there will be a signing event at Amoeba Music in Hollywood with the directors of the smash-hit superhero action-thriller! WHO: Directors Anthony & Joe Russo (“Community,” “Arrested Development”). 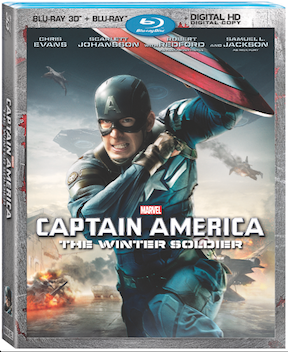 From the studio that brought you the biggest Super Hero movie of all time, Marvel’s The Avengers, comes Marvel’s Captain America: The Winter Soldier, now available on Digital 3D and HD and arriving on 3D Blu-ray Combo Pack, Blu-ray, DVD and On-Demand September 9th, from Walt Disney Studios Home Entertainment. Saluted by critics as “action-packed” (NY Daily News), “thrilling” (Cinema Blend) and “better than The Avengers” (Access Hollywood), this blockbuster second chapter in the Captain America series teams Marvel’s First Avenger, Captain America, with Black Widow and new ally The Falcon as they battle their most mysterious and powerful enemy yet, the Winter Soldier.